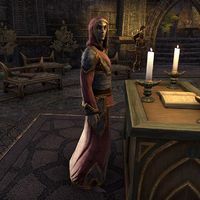 Acolyte Sethrin is a Dunmer priest found inside the Tribunal Temple in the city of Ebonheart. "Go with the Tribunal's blessing, in the name of the Lord, Mother, and Wizard." This page was last modified on 7 March 2019, at 16:27.